For the second week in a row, our "early preview" of the weekend included a pretty wet outlook. But also, for the second week in a row, the forecast continues to improve as the weekend approaches. As this post's headline suggests, it is going to rain for the 7th consecutive weekend. But it will not rain everywhere in the state. And it certainly will not be a washout. For the 6th morning in a row, we're enjoying a truly comfortable start to the day with low humidity and temperatures generally in the 50s. That's actually a bit cooler than I expected, which makes me think high humidity will be mostly quashed for one more day. Your Friday is certainly going to be summerlike, with most high temperatures in the lower 80s. Thermometers could climb as high as 85 in SW NJ. It will be cooler along the coast, thanks to the sea breeze, closer to 70 degrees. Barrier islands will be the coolest spot in the state. While the morning hours look mostly sunny, clouds will increase quite a bit by Friday afternoon. Dew points will jump into the 60s too, making it feel more humid. (Although, again, not really "muggy" or "oppressive".) 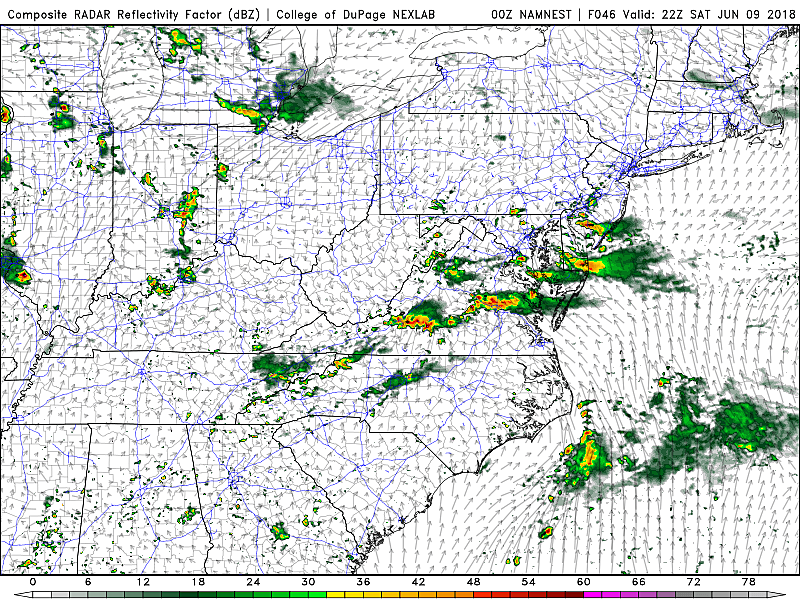 Furthermore, models suggest a shower or thunderstorm will be possible between about 5 p.m. and 10 p.m. If something pops up (and that's a big "if"), it will be isolated. Clouds and some patchy fog are expected for Friday night. Thanks to increased humidity, it will not be as cool or as comfortable as the last six nights in a row. Overnight low temps will only dip into the lower to mid 60s. The weekend forecast still looks unsettled and complicated, thanks to a stalled front. We'll see hit-or-miss thunderstorms on Saturday. 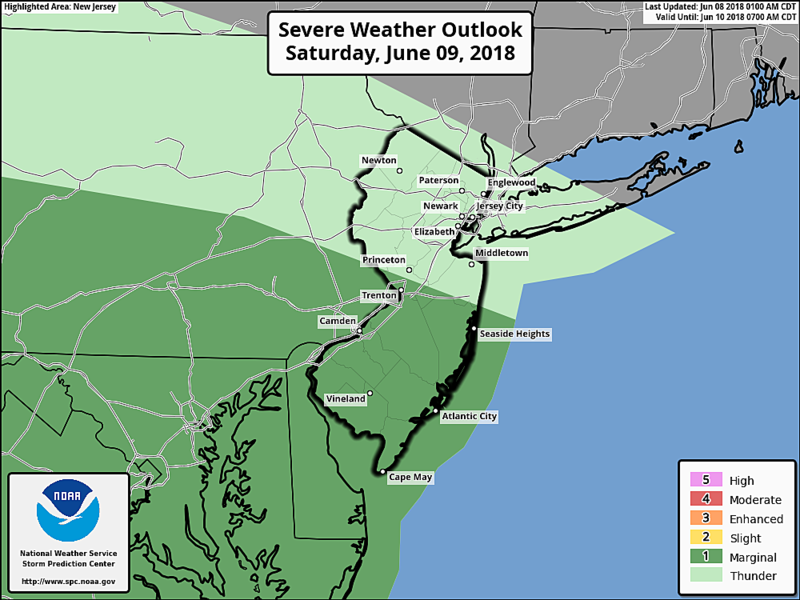 The highest chance for storms, by far, will be in South Jersey — Camden, Gloucester, Salem, Cumberland, Atlantic, and Cape May counties. A few showers and thunderstorms are possible around the Burlington, Ocean, Monmouth, and Mercer county area. Further north? I wouldn't be surprised if we stay dry all day Saturday. Saturday's Severe Weather Outlook from the Storm Prediction Center. Any storm that does form will be capable of producing locally heavy downpours and gusty winds. The Storm Prediction Center has put the southern half of the state in a Marginal Risk of severe weather on Saturday. In previous forecasts, I had suggested a band of heavy, steady rain — in the form of an MCS (Mesoscale Convective System) — would pass through New Jersey Saturday night. That solution has now completely disappeared from all forecast models, a function of how delicate and volatile this stalled front setup is. No complaints about a drier weekend forecast, at all! Sunday looks like the cooler, drier day of the weekend. (I am notably throwing the NAM model forecast out the window, as it paints an unreasonably wet picture for Sunday afternoon. That's contrary to every other forecast scenario out there right now.) We'll keep a stray shower chance in the forecast, and skies will remain mostly cloudy to overcast for the second half of the weekend. High temperatures will be limited to the lower to mid 70s. It looks like another batch of rain will push into southern New Jersey on Monday, before a stretch of drier, hotter weather takes over by midweek. We could see have a couple of 90-degree days coming down the pipeline around the Wednesday-Thursday time frame.